Last night, a friend — and nail art fan — commented that I should use glitter to mimic the sugar on the peach rings and I thought that was a BRILLIANT idea. I did some experimenting on my right hand and after testing out a few methods, I decided on a very thin coat of Orly Tiara on top of yesterday’s mani. I wanted to post these pics last night but I had a feeling that sunlight would show it off better and I was right. 😀 I think the glitter mimics the sugar pretty well and it also adds quite a bit of shine to the overall look. Sadly I didn’t have any peach rings for props in this photo because I ate them yesterday as soon as I was done taking pictures…. 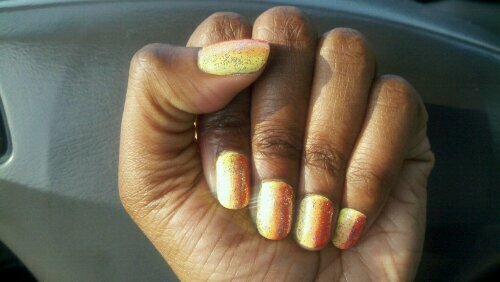 Posted on May 12, 2011, in Inspired by... and tagged Brights, China Glaze, China Glaze Cherry Pie, manicure, nail art, nail polish, Orly, Orly Lemonade, Orly Tiara, Peach Rings, Summer, Summer Nail Color, Summer Nail Trend, Wet n Wild, Wet n Wild 9.0.2.1.Orange. Bookmark the permalink. Leave a comment.